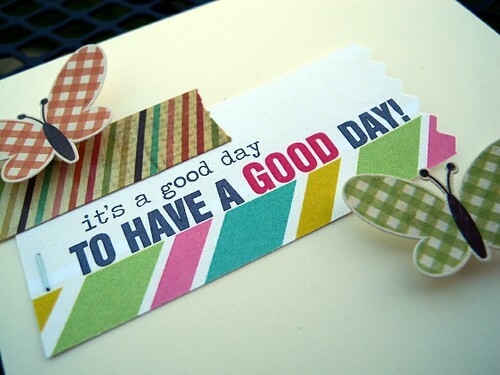 Just Jingle: It's a Good Day to Have A Good Day! First of all, I want to take a moment to thank each and everyone of you who voted for me throughout the Paper Crafts Gallery Idol competition. As you may likely know by now, no, I did not win the grand prize, however, I am SO honored to be included in the Top 5 and your show of support was overwhelming! You guys seriously brought me to happy tears more than once! This was such an amazing experience, and I am so happy to have had the opportunity to participate! Now...being that it is a brand new month, Scrapbook Circle has a brand new kit for you! And, it's pretty much amazing. Just say'n. It's called Sunshine Day and it will make ANY day feel JUST.LIKE.THAT. For reals, though, you guys. I wouldn't lie about something this serious. HA! I have had SO MUCH FUN playing with this kit! I love it! Absolutely love it! Here is one of the first cards I created with this kit. LOOK AT ALL THAT FUN HAPPY STUFF! LOL! No, for reals, though, I love this one! 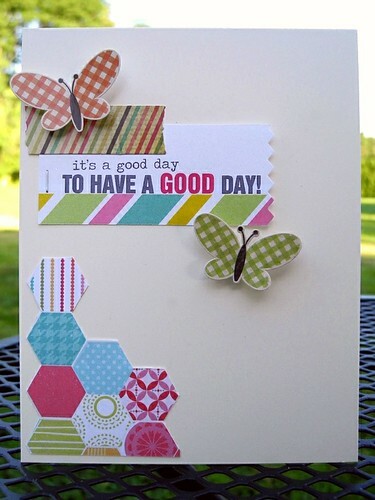 The colors make me happy, the shapes make me happy, the butterfly stickers make me happy, AND the sentiment makes me happy. So...pretty much there is just a whole lot of happy going on up in here today! YAY! So, there you go! A nice happy for your Monday! I hope your day is AMAZING!!! See ya later, bye! love the card and the butterflies! adorable! This is a fun card filled with cheer. P.S. Congratulations on making the Top 5!!!! I just LURVE this awesome card!! love the card~love the design!!! that kit looks fun. the butterflies are cute and your card? FRESH! Soooo cute Jingle!!!! I love this! Fabulous kit and I love your happy project! such an awesome kit...love all the fun colors...your card is super sweet!!!!!! !